RogerBlazic.com: Facebook Protection Of Marriage Page Hacked. Hysterics Ensued. Facebook Protection Of Marriage Page Hacked. Hysterics Ensued. On Saturday, April 23, 2011 a Facebook protection of marriage page was hacked and hysterics ensued. What is interesting is what is going on in the aftermath. Saturday, I spotted on my Facebook News Feed the One Man, One Woman Fan Page, and there were dozens and dozens of comments. What was causing all the ruckus? The photo for the page had been changed to a picture of the owner of the page with the headline: Everyone Should Be Allowed To Marry. Join me. At the time, people were speculating that the page was hacked. Comments were fast and furious. "You are representing something fraudulent"
"I'm dropping my membership to this page." "Calm down. The page was hacked"
"I think this is scam." "I'll never support gay marriage"
There was a lot of anger and confusion in the comments. I'm not quite sure if Marinelli came out of the closet. But it is very clear that he has chosen to support marriage equal rights. I don't know how many people defected from the page, but it still has over 282,000 fans. And something very odd is happening on that page. Visitors to the page who have left posts on the wall are very supportive - and they're not all gay, lesbian or bi. Even the very religious are showing compassion. This incident's initial reaction shows how virulent the prejudice is to gay, lesbian and bi individuals in our society. Homophobia still reigns. It will probably never go away, just like we will always have racism and violence toward women and children. None of the above are right or just. 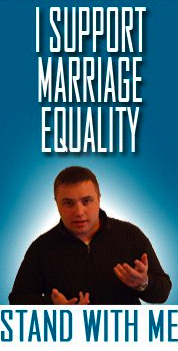 Protection of Marriage: One Man, One Woman or try this link. Initially, it looked like the Facebook Protection of Marriage page was hacked. Hysterics did ensue. But compassion followed. Maybe that is what we can settle for as progress.